Recently someone asked me what they can do with their young colt prior to having him started in a few years, and I thought my answer to the question would make a great post, as it is a common question! -Etc, etc, etc...anything you can do, do. He can do a lot of things without actually carrying a rider (even pack him - albeit lightly - if you're on trails, if possible). Packing a horse strengthens him physically, teaches him body awareness, teaches him how to handle himself with weight, and accustoms him to the actual weight itself. However, while exposing him to everything and earning his trust is great, make sure you remember to also earn his respect. Too many young horses come to me thinking it is okay to walk all over me, which can be dangerous. Practice things like having him move out of your space (both using physical pressure - the Parelli Porcupine game, and using body language - the Parelli Driving game). Make sure he does not come into your space unless invited - ever (just do this by holding yourself in a manner that commands respect, by moving him out of your space when he does come in, and by playing games that earn his respect in the first place). Of course do not ever try to force him to do anything, but at the same time set him up so that he does act respectfully, and always be assertive (yet never aggressive). I am just as guilty as any to be won over by a cute foal face, but we have to remember to always be assertive (though we can still just be super friendly and undemanding as well at times). I would highly recommend the Parelli 7 games with him and even the Liberty and On-Line patterns. Just listen to him as to how long/short his sessions can be (though if you're interactive enough and he's having fun, you can usually go on for quite awhile), but he can play all those games/patterns at his age (even a foal can). 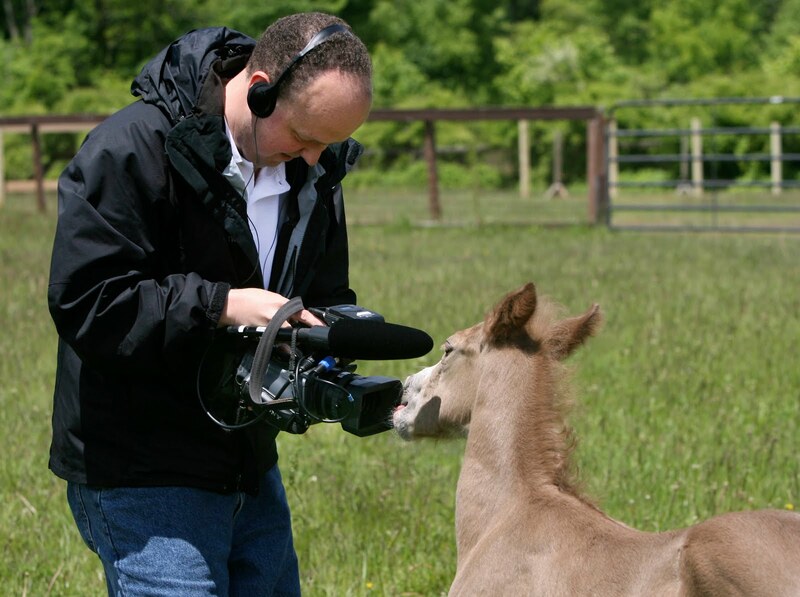 Expose expose expose those foals. I highly recommend Dr.Miller's Imprint Training of the Newborn Foal as well as the Parelli 7 games and patterns. Just remember to always earn a young horse's respect as well as their trust; you're creating the foundation for a horse who is one day going to be 10x the size he is as a foal! Anything he gets away with now, he is going to figure is fine when he is later 1,000lbs. If you're unsure, take a look at momma and how she interacts with her foal - she'll deliver plenty of lovin' but she also won't hesitate to give him a good nip in the rump when he's being disrespectful toward her (this does not mean you should be hitting your foal, however there should be boundaries - little touches are okay when they are accompanied by phases and by proper communication). If you're really unsure and don't feel you have the expertise to deal with a foal, a) get professional help and b) turn the foal out with older horses who will set a good example and who will teach him to be a behaved and balanced horse. Not 5 or 6 year-old geldings, either...20yo broodmares (or the like). Don't turn teenagers out with teenagers, or kids out with teenagers - make sure your young horses have a (or several, preferably) good examples to follow and to keep them in line. Don't underestimate the importance of such - raising a foal with other foals only or with a gelding or mare who never establishes boundaries could easily create a monster.